At AH Stock Manufacturing Corp., we offer our customers a solution to all of their manufacturing needs, from engineering to finished products. 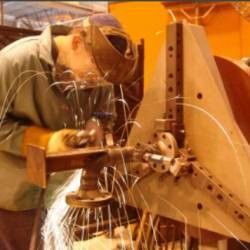 In addition our welding department consists of wire welding machines ranging from 300 to 600 amps, heliarc welders, aluminum welders, stud welders, and spot welders. We also have welding positioners that allow us to handle up to 3000 pounds. Call us today at 920.726.4211 to speak to one of our friendly and knowledgeable sales professionals.